Disclaimer: This post is brought to you by Freshly Picked. All opinions are my own. Freshly Picked moccasins are seriously the best baby and toddler shoes ever. Not only are they super cute and on trend, but they're also comfortable and soft on little feet. The best bit though is that they almost never fall off! There aren't many shoes for little ones that you can say that about. Mathilde has been wearing Freshly Picked moccs since she was 5 months old. She has been walking since she was 10 months old and her moccs have always held up just fine. Being made of leather, they tend to stretch a little too which helps make them last longer as little feet grow. How cute is this handmade bear bib? Pretty freaking cute, if you ask me! Mathilde has one of the original Roxy Marj bibs from a collaboration with Anthropology last year and I love it. You may remember it from her 1st birthday party. In fact, I actually based the theme of Mathilde's birthday party around that bib! The new bibs (available directly from Roxy Marj) are even more adorable than the original. They come in both bear and tiger designs, and, now here's the cutest part, they are double sided with the back featuring the animal asleep. Stacking toys are always popular with little ones. There are so many different styles available, but I just love the clean modern lines of this bunny from San Francisco based Petit Collage. It's cute, but not cutesy, if you get what I mean. The colors aren't offensively bright so this piece will look just as great sitting in the middle of a grown up living room as in a nursery. Now that the weather is cooling down, little heads need something to keep them warm. It doesn't hurt if that something just happens to be down right adorable too! This unisex bear ear bonnet from Frankie & Juniper is handmade right here in the Bay Area out of the softest denim and lined with snuggly plaid flannel. Mathilde has one of these bonnets (in floral flannel) and we get comments about how adorable she looks in it all the time. And trust me, she does look adorable in it! You can check her out here. Wooden teethers are a classic comfort toy for little ones. But classic things don't always have to look old fashioned. Take this Lexypexy pretzel shaped teether for example. I love that it looks like food, but not in a cheesy, gimmicky way. Each teether is made from natural sustainable maple wood which is rock hard, naturally antibacterial, and non splintering. The design is permanently etched into the wood on both sides. Lexypexy teethers are available in a range of fashion and food inspired designs. Cooler weather calls for snuggly warm blankets to cuddle up under. This swan blanket from Spearmint Love is perfect. It's a great heavy blanket for cuddling up on the sofa, for baby to lay on or for keeping toasty warm in bed. It is made in the USA from a cotton and acrylic blend (80/20) and measures 30 x 40 inches. I love the simplicity of the swan design - and as an Australian the white swans are a novelty for me! This blanket is available in a wide range of colors plus lots of other on trend designs including pineapples, hearts, apples, watermelon and crosses. The modern design of these blankets means they look just as great in the living room as they do in a nursery. "A turban?" I hear you say. Yes, a turban! These little hats from Los Angeles based Ultra Violet Kids are super stylish. Often times when grown up pieces of clothing are redesigned for children the result just looks uncomfortable and outdated. I'm looking at you toddler tuxedo! That's not the case with these little turbans. Your little fashionista is going to look adorable in one of these super soft jersey turbans. They look great on little babies with no hair and on toddlers with crazy toddler hair sticking out all over the place. Or toddlers with perfect hair that sits just so, if you happen to be lucky enough to have one of those! I just ordered one of these for Mathilde and I can't wait to see her in it. For each turban sold Ultra Violet Kids will donate one to a baby, child, teenager or adult who has lost their hair due to medical treatments. I love supporting small businesses that give back to the community in such meaningful ways. 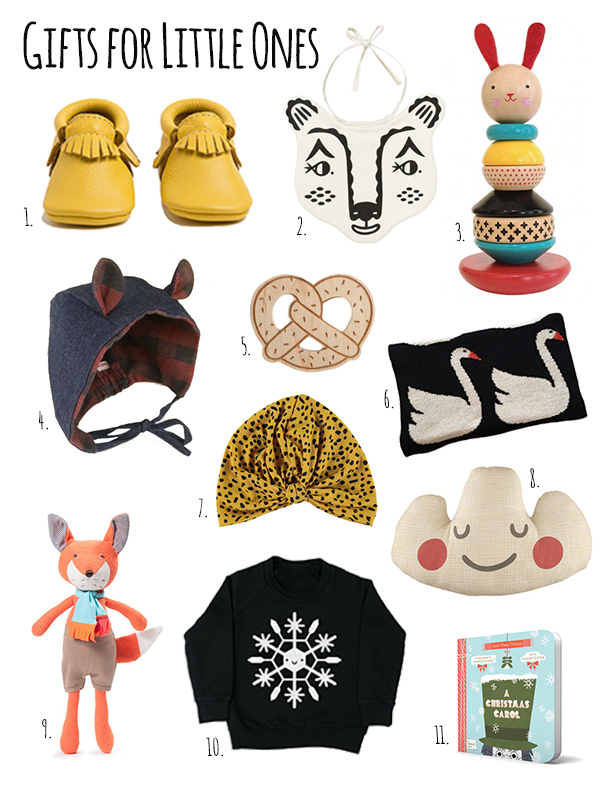 I couldn't put together a gift guide for little ones and not include a cuddly friend, could I? Reginald Fox from Hazel Village is perfect for little ones. He's 15" tall, made from soft organic cotton knit, and his face and spots are hand embroidered. No nasty plastic eyes etc that could fall off and pose a potential choking risk. Plus, he's just adorable, don't you think? If foxes aren't your thing, don't worry, Reginald has a whole village of woodland friends and they're all just as cute as he is. Monogramming is available for an extra personal touch. There are even dress ups available for Reginald and his friends! Canadian label Whistle & Flute make the cutest t-shirts and sweaters for kids. You may remember my girls in their matching Kawaii ice cream t-shirts at Lola's ice cream themed birthday party last year, or more recently in their bat and ghost t-shirts this Halloween. I find myself wanting to buy everything in the Whistle & Flute store! This snowflake sweater is perfect for Christmas, even if, like us, you don't actually live somewhere snowy. We can pretend, right? I have one of these stashed away as a Christmas present for Lola. She's obsessed with everything Frozen so I just know she's going to love this, especially because it's sparkly! Are you familiar with BabyLit books? I love the idea. Classic novels in the form of a baby and toddler friendly board book. Classic! Of course, the stories are condensed just a *little*, but these board books are perfect for introducing little ones to the world of literature. Or at the very least they provide parents with something they're actually interested in sharing with their kids! Each book uses the characters and story from the original to teach children about colors, numbers, animals, emotions... The perfect mix of baby book and classic literature. And what could be more perfect for Christmas than a BabyLit version of Charles Dickens' A Christmas Tale? Mathilde will be finding one of these under the tree this year as may a few little friends. Ah, so many wonderful gift ideas to choose from. I hope my gift guide has inspired you. Each item in this gift guide represents a brand that I feel an affinity for. They are mostly small brands, and many of the items are handmade. The items are all top quality which I feel is so important in a world of disposable plastic goods. I love giving gifts that I know will bring happiness for a long time to come, and maybe even become an heirloom to be passed down. ... My Freshly Picked moccasin give away! One lucky person will win a pair of Freshly Picked soft soled moccasins in their choice of color and size for a little one on their gift list. Please note that entry is limited to residents of the United States only. Sorry, international shipping is not available. The winner must be following both Little Hiccups and Freshly Picked on Instagram. The giveaway ends 11:59pm PST Sunday December 6th. The winner will be announced on Instagram (Little Hiccups) on Monday December 7th.